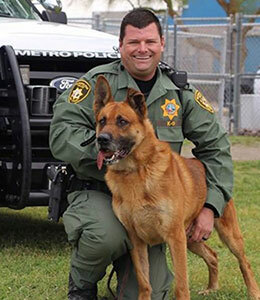 Stop by the dog demo area in the back of the exhibit hall to see exciting K-9 demonstrations on Tuesday at 10:30 a.m .and 12:00 p.m. 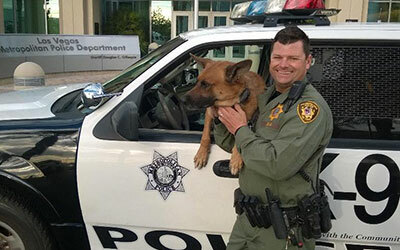 Officer Dukes has been employed with LVMPD since July 1997 and has been assigned to K-9 since October 2005. His partner, Max, is a Belgian Malinois / Shepherd mix and has been with him since 2010. Max is also trained in cadaver and evidence detection. Darko, his Explosive Detector Dog, is a six-year-old Dutch Shepherd. Have you ever wondered what the difference between a service dog and a therapy Dog is? Then be sure to stop by the demo area on Monday, August 6 at 10:30 a.m. and again at 1:00 p.m. for a dog therapy presentation by the Las Vegas-based organization Tales-to-Tails Therapy Dogs. Tales-to-Tails Therapy Dogs is a reading program that works with special needs students in local schools to aide in improving their reading skills and recently they have expanded their services to assist the elderly. Come meet the founders and trainers, Darlene Barzideh and Janet Edberg, and their certified therapy dogs!